The Japanese River Otter (Lutra nippon), a member of the weasel family, is a nocturnal carnivore reaching 65 to 80 centimeters (26 to 30 inches) in length at maturity. The animal is characterized by its webbed-feet and streamlined body with dark brown back and light brown belly, as well as by its thick, long tail, which is very common to the weasel family. The species inhabits midstream and downstream regions along rivers and becomes active at night, searching for fish, shrimp, and crabs for prey. While the animal hunts for food mainly in the water, it spends the rest of its time on land sleeping and rearing its young. Once abundantly dispersed throughout Japan, the Japanese River Otter was reduced to very small numbers during the Meiji and Taisho eras due to the hunting of its fur and liver, which was applied as a medicine for patients with Tuberculosis. Moreover, environmental changes, such as the decrease of habitats, breeding grounds, and prey due to large-scale river-related construction and industrial and agricultural water contamination, have accelerated the decrease of the animal. Many of the species were also killed by dogs, their natural enemies, as well as by cars. Due to serious concerns about its possible extinction, the Japanese River Otter was designated as a special natural treasure of Japan in 1965. 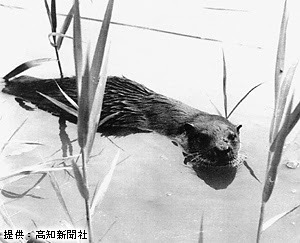 However, the last official sighting of the otter was in Kochi Prefecture in 1979, and the existence of the creature has not been corroborated since then. Non-governmental organizations as well as the Environment Agency and prefecture and city governments have commissioned searches by specialists in the field to ensure its survival. Recent sightings of the Japanese River Otter have been reported by various sources, but have not yet been officially confirmed. The Japanese River Otter has widely inhabited river regions throughout Japan, encompassing the main islands, Hokkaido, Honshu, Shikoku, and Kyushu. It mainly inhabits midstream and downstream regions. In order to meet the needs of its active life and high energy consumption, which require a large amount of food, the otter travels over 10 kilometers (6.25 miles) along rivers and seashores where prey is plentiful. Although it is believed to live only in the southern region of Shikoku island, sightings of the animal have not been officially confirmed. This is sort of strange that I found this blog. I am not sure how recent this posting is, but I think I have found a river otter. I am from Northern California and would say I am very good at identifying animals. My wife and I have spotted a small family of otters or muskrats in a pond close to our house. I am not sure if there muskrats in Japan, but we did research and it seemed more likely that they were otters. We got a closer look tonight, but it is very dark. I know this pond is filled to the brim with fish and maybe that is what has driven to it. I am going to bring a flash light tomorrow to get a better look. I do not own any sort of night vision, but would like to get a better look. If you have more questions please feel free to email me. I am very excited to spot such a creature. I live in Nishi-ku, Kobe. I am looking forward to hearing back from you.